All WordPress themes come with a powerful functions.php file. This file acts as a plugin and allows you to do lots of cool things on your WordPress site. 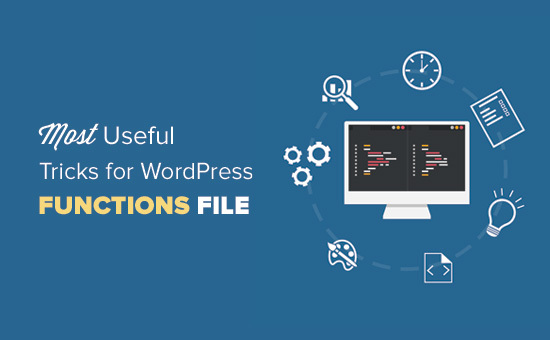 In this article, we will show you some of the most useful tricks for your WordPress functions file. 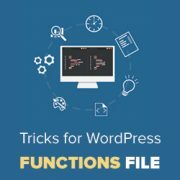 What is Functions File in WordPress? Functions file commonly known as functions.php file is a WordPress theme file. It comes with all free and premium WordPress themes. The purpose of this file is to allow theme developers to define theme features and functions. This file acts just like a WordPress plugin and can be used to add your own custom code snippets in WordPress. You would find many of these code snippets on websites like WPBeginner with instructions telling you to add this code in your theme’s functions.php file or a site-specific WordPress plugin. Now you may be thinking what’s the difference between a site-specific WordPress plugin and functions.php file? Which one is better? While functions.php file is more convenient, a site-specific plugin is much better. Simply because it is independent of your WordPress theme and would work regardless of which theme you are using. On the other hand, a theme’s functions file will only work for that theme and if you switch the theme, then you will have to copy / paste your custom codes into the new theme. Having said that, here are some extremely useful tricks for the WordPress functions file. You should always use the latest version of WordPress. However, you may still want to remove the WordPress version number from your site. Simply add this code snippet to your functions file. For detailed instructions, see our guide on the right way to remove WordPress version number. Want to white label your WordPress admin area? Adding a custom dashboard logo is the first step in the process. First you’ll need to upload your custom logo to your theme’s images folder as custom-logo.png. Make sure your custom logo is 16×16 pixels in size. After that you can add this code to your theme’s functions file. For alternate methods and more details see our guide on how to add a custom dashboard logo in WordPress. The footer in WordPress admin area shows the message ‘Thank you for creating with WordPress’. You can change it to anything you want by adding this code. Feel free to change the text and links that you want to add. Here is how it looks on our test site. 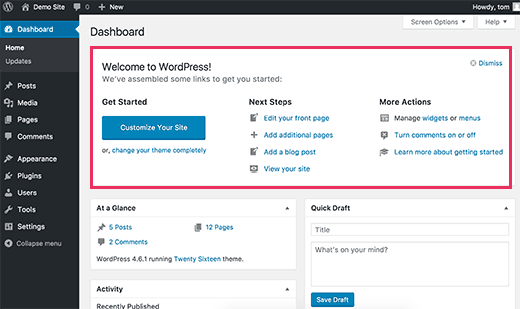 For details, see our tutorial on how to add custom dashboard widgets in WordPress. Have you seen the default mystery man avatar on blogs? You can easily replace it with your own branded custom avatars. Simply upload the image you want to use as default avatar and then add this code to your functions file. Now you can head over to Settings » Discussion page and select your default avatar. 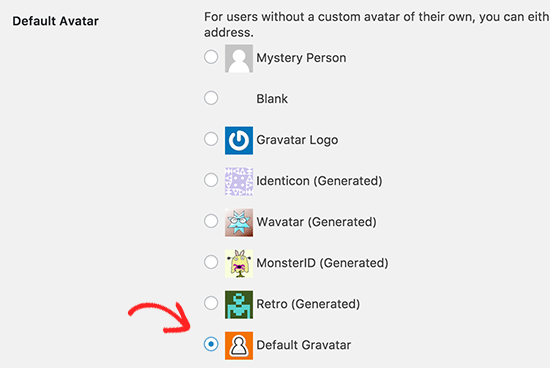 For detailed instructions, see our guide on how to change the default gravatar in WordPress. You can simply add copyright date by editing the footer template in your theme. However, it will not show when your site started and it will not automatically change next year. You can use this code to add a dynamic copyright date in WordPress footer. This function looks for the date of your first post, and the date of your last post. It then echos the years wherever you call the function. For more details, see our guide on how to add dynamic copyright date in WordPress. Do you want to randomly change background color on your WordPress upon each visit and page reload? Here is how to easily do this. First you need to add this code to your theme’s functions file. You can now save your changes and visit your website to see this in action. For more details and alternate methods, see our tutorial on how to randomly change background color in WordPress. If your WordPress login page keeps refreshing or you are unable to access admin area, then you need to update WordPress URLs. One way to do this is by using wp-config.php file. However, if you do that you will not be able to set the correct address on the settings page. The WordPress URL and Site URL fields will be locked and uneditable. If you want to fix this, then you should add this code to your functions file. Once you are logged in, you can go to Settings and set the URLs there. After that you should remove the code you added to the functions file, otherwise it will keep updating those URLs any time your site is accessed. WordPress automatically creates several image sizes when you upload an image. You can also create additional image sizes to use in your theme. Add this code your theme’s functions file. This code creates three new image sizes with different sizes. Feel free to tweak the code to meet your own requirements. You can display an image size in anywhere in your theme using this code. For detailed instructions, see our guide on how to create additional image sizes in WordPress. 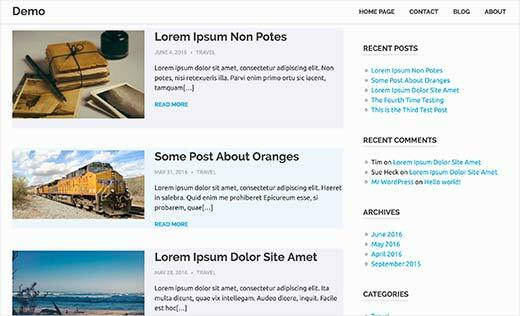 WordPress allows theme developers to define navigation menus and then display them. Add this code in your theme’s functions file to define a new menu location in your theme. You can now go to Appearance » Menus and you will see ‘My Custom Menu’ as theme location option. Now you need to add this code to your theme where you want to display navigation menu. 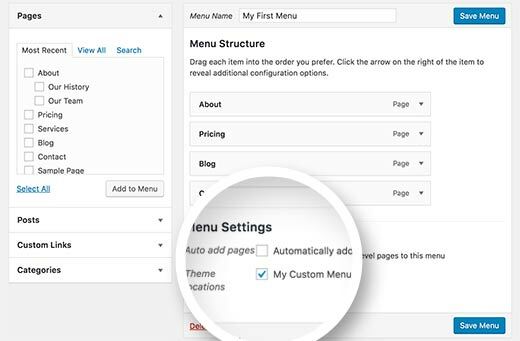 For detailed instructions, see our guide on how to add custom navigation menus in WordPress themes. This code will add Twitter and Facebook fields to user profiles in WordPress. You may also want to see our guide on how to add additional user profile fields in WordPress registration. You can now visit Appearance » Widgets page and you will see your new custom widget area. For more details see our guide on how to add dynamic widget ready areas and sidebars in WordPress. For more information, see our guide on how to add content and completely manipulate your RSS feeds. The post thumbnail or featured images are usually only displayed within your site design. You can easily extend that functionality to your RSS feed with a simple function in your RSS feed. For more details see our guide on how to add post thumbnails to your WordPress RSS feed. 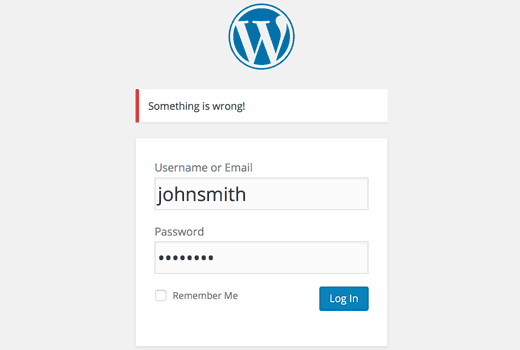 Login errors in WordPress can be used by hackers to guess whether they entered wrong username or password. By hiding login errors in WordPress you can make your login area a bit more secure. Now users see a generic message when they enter incorrect username or password. For more information, see our tutorial on how to disable login hints in WordPress login error messages. WordPress allows users to login with username or email address. You can easily disable login by email in WordPress by adding this code to your functions file. For more information see our guide on how to disable login by email feature in WordPress. If you want to disable search feature on your WordPress site, then simply add this code to your functions file. For more information, see our tutorial on how to disable search feature in WordPress. Sometimes you may end up with a grammar or spelling mistake in your article. The mistake goes live and is distributed to your RSS feed subscribers. If you have email subscriptions on your WordPress blog, then those subscribers will get it as well. Simply add this code in your theme’s functions file. In this code we have used 10 minutes as $wait or delay time. Feel free to change that into any number of minutes you want. For plugin method and more information, see our detailed guide on how to delay posts from appearing in WordPress RSS feed. Do you want to change the text that appears after the excerpt? Simply add this code to your theme’s functions file. Not all websites need RSS feeds. If you want to disable RSS feeds on your WordPress site, then add this code to your theme’s functions file. For a plugin method and more information, see our guide on how to disable RSS feeds in WordPress. WordPress limits excerpt lengths to 55 words. If you need to change that, then you can add this code to your functions file. Change 100 to the number of words you want to show in the excerpts. For alternate method, you may want to take a look at our guide on how to customize WordPress excerpts (no coding required). If you have forgotten your WordPress password and email, then you can add an admin user by adding this code to your theme’s functions file using an FTP client. Don’t forget to fill in the username, password, and email fields. Once you login to your WordPress site, don’t forget to delete the code from your functions file. For more on this topic, take a look at our tutorial on how to add an admin user in WordPress using FTP. Welcome panel is a meta box added to the dashboard screen of WordPress admin area. It provides useful shortcuts for beginners to do things on their new WordPress site. You can easily hide by adding this code in your functions file. For other methods and more details check out our guide on how to remove welcome panel in WordPress dashboard. Do you want to show total number of registered users on your WordPress site? Simply add this code to your theme’s functions file. This code creates a shortcode that allows you to display total number of registered users on your site. Now you just need to add this shortcode to [user_count] your post or page where you want to show the total number of users. For more information and a plugin method, see our tutorial on how to display total number of registered users in WordPress. Do you want to exclude specific categories from your WordPress RSS feed? Add this code to your theme’s functions file. By default, WordPress does not execute shortcodes inside text widgets. To fix this you need to simply add this code to your theme’s functions file. For an alternate method and more information, take a look at our guide on how to use shortcodes in WordPress sidebar widgets. You may have seen WordPress themes using an old or even class for WordPress comments. It helps users visualize where one comment ends and the next one begins. You can use the same technique for your WordPress posts. It looks aesthetically pleasing and helps users quickly scan pages with lots of content. Simply add this code to your theme’s functions file. This code simply adds an odd or even class to WordPress posts. You can now add custom CSS to style them differently. Here is a sample code to help you get started. Need more detailed instructions? Take a look at our tutorial on how to add odd/even class to your post in WordPress themes. This code allows you to upload SVG and PSD files to WordPress. You will need to Google to find out the mime types for the file types you want to allow and then use it in the code. For more on this topic, check out our tutorial on how to add additional file types to be uploaded in WordPress. By default, when you upload an image in WordPress it is automatically linked to the image file or the attachment page. If users click on the image they are then taken to a new page away from your post. Now when you upload a new image in WordPress, it will not be automatically linked. You can still link it to the file or attachment page if you want. You may want to check out our tutorial on how to remove default image links in WordPress for an alternate plugin method and more information. Next you will need to add some custom CSS to make it look better. You can use this sample CSS as an starting point. For plugin method and more detailed instructions, check out our article on how to add an author info box in WordPress posts. XML-RPC is a method that allows third party apps to communicate with your WordPress site remotely. This could cause security issues and can be exploited by hackers. You may want to read our article on how to disable XML-RPC in WordPress for more information. If your WordPress theme does not automatically link featured images to full articles, then you can try this method. Simply add this code to your theme’s functions file. 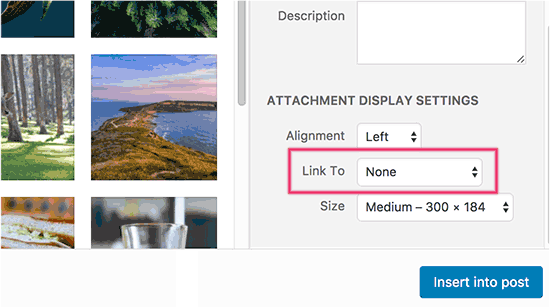 You may want to read our article on how to automatically link featured images to posts in WordPress. We hope this article helped you learn some new useful tricks for functions.php file in WordPress. You may also want to see our ultimate guide to boost WordPress speed and performance. Almost NONE of these code snippets belong in your theme’s functions.php file. Only a few of them are related to the actual theme. Themes are for APPEARANCE. Create a PLUGIN for functionality. In any case, it would go in child theme’s functions.php file. Thank you for pointing this out, while we do mention site-specific plugins at the beginning of this article, we will be sure to look into making that statement clearer. Nice information for a new bloggers. It is really helpful. Thank you so much for making this resource available. WP for Beginners is the best goto site on the web! hey i am unable to add my post on specific page. when i write any blog post it shows in home page but i wanna also see in specific pages where i want to add. how i can out of from this problem. plz help me as soon as possible. if any video link thn plz share with reply. i m getting too much confused. I am creating a form to collect data from my users. I have created the form. Now i expect it to gather, peoples registration details. But clicking on submit on the form, says, page cannot be found. I dont know what i am not getting right. is there a plugin one can use to customise a theme’s default menu setting to suit your taste??? A question – Because you’re updating the functions.php of a theme. If you update the theme then you lose your tweaks. Is there a way around this? Is it just a cause of using a Child theme? Any changes you make to a parent theme will be overwritten when you update it. It is good practice to work with a child theme when making changes to a theme you didn’t build that is going to be updated so that you can keep the changes you made. This is late, but you can also create a plugin for your site (e.g. “[Site name]’s custom plugin”). It does require a bit of expertise, however, since some functions clash with other plugins/the site theme. How to use these above with child theme functions file? I’ve not done much with the functions file so it was good to see this article. Great snippets. Very handy and useful. Thank You! will you tell me a most easy book for wordpress. i am very new in this field . This is the best blog for WordPress users. I am a newbie and looking for such tricks. Really a nice blog. i had learn lot of things from here thanks admin. I tried #16 to add the post featured thumbnail to m RSS feed but when I tested it in mailchimp (paused my campaign and previewed) it appears that it has changed from “summary” to “full text”? Is this expected behaviour? I want to leave the emails (rss driven) as summary, and simply add the thumbnail featured image at the top. Thanks for any help, I can’t find this on google anywhere. You can try replacing get_the_content() with get_the_excerpt(). re: removing rss feed for static pages — is it correct that the txt one would replace in that code is ‘url’ (with a page link, including ) and ‘homepage’ (if you’d like it to say something else, like ‘some other site’)? This is huge list and great help. would like to know the first part of twitter counter code is to be pasted in function.php or directly into texty widget of theme. such a great and useful tricks.. Such a nice list of useful tricks. It will help both plugin and theme developers. In #14, isn’t that a instead of ? Thanks for the helpful article. I really appreciate it. Can you possibly explain why the snippet to add Google analytics (#1) code includes the php declarations. If I have an existing functions.php file that is already defined with , do I need to include the	markers again in the snippet? I’m trying to add other customizations into the functions.php and it’s getting hard to keep track. It includes opening php because it is closing PHP tag to allow you to paste plain HTML Google analytics code. The one about the copyright date seems a little OTT when you could simply cut and paste in © 2006- and it would do exactly the same job, just replace 2006 with whatever static start date you wish. Or am I missing something? Yes, you can definitely do that. But if you are releasing this as part of a theme meant for distribution, then you can’t do that. Excellent, I was done with my theme and learning but there was much left. This post saved my day and of course I learnt many things as well. In “Add Author Profile Fields”, the function you mentioned to echo is not working. The curauth would only work if it is on author.php file. Great set of tools. I immediately copied the guest author function as I saw it and will now disable a clumsy plugin I’ve been using. Do you have a function that will provide the post ID of the item being worked with in the editor? I’m trying to auto fill a form with media attachments for the current post but have only been able to get it to work in a custom meta-box but not in a thickbox . The thickbox returns all the media files for all the posts when I just want the current posts’s attachments. Thanks for the great WordPress tips! I was hoping you could help me with an additional one? Like all the others have said below – just too good, a massive help for a newbie and very useful for learning too. Great site all round. Thanks. one of the best tutorials i read. Many important topics pointed out and for sure i didn’t know most of them since i just started wordpress custom design. This article is endlessly useful. I bookmarked it and often refer to it when updating my theme or trying to answer a question. Great job! You guys are just awesome. You know what, wpbegineer is the first website for which i have a separate folder in my bookmark menu. Too good for a wp begineer. youe name suits ur personality. lolz. One day i would must do something special for you. Inshallah. The only problem i face is related post with thumbnail. your coder are not working. vDont know what to do. Whatever, Keep up the marvelous job. Love the site wpbegineer. Great post! You obviously know a lot about wordpress coding so I’m hoping you can answer a question. How to you remove the date & time stamp from a wordpress feed-rss? I’ve looked everywhere and can’t find any information on this. I’m working on a wordpress “site” and do not have a use for the dates. I have already removed them from the posts & pages. Date is NOT optional for RSS feeds. It is a MUST because that is how posts / articles are organized (reverse chronological order). You can remove the display of dates from the template, but you cannot remove them from the XML. Awesome post! Can’t wait to get started on the custom dashboard gravatar! Really exceptional post. Great article, I’ve bookmarked it for future reference. Just found wpbeginner by chance what a great resource, thanks! Good stuff, bookmarked this already. Can see a few of these come to good use more than once. Cheers, Mark. Just a note, be careful when you copy and paste the “end of excerpt” function. It showed a question mark instead of “…” since it was one character. I had to rewrite “…” for it show up. Probably the best post about the use of functions.php. Thanks for the tricks and for saving our time. Wow! Some really handy stuff there! I would suggest an addendum be made to Tip #3 mentioning the fact that this is not security in any way shape or form, and is definitely not an alternative to upgrading as people should. Could you tell me if I need to add these codes for every theme which my multi site have? Is there any there way which these codes automatically apply to the newly added themes? You would have to add these to your theme’s functions.php file. So if it is a theme that is available on all networks, then only once. If there are custom themes being used on each network site, then you would have to do it on each…. Very nice list. I didn’t know you could do so much with the functions.php file! You guys rock!!! Thanks for the awesome post.